Kodiak Brown bears are without question the largest Brown bears in the world! 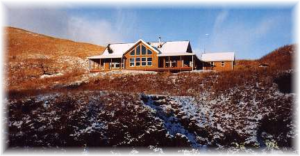 Wild Alaska Adventures and Little Eagle Lodge have combined forces to offer guided Brown Bear hunts on the Eastern shore of Kodiak Island in Ugak Bay. ADF&G claims this area has some of the highest concentrations of Brown Bear on Kodiak Island. 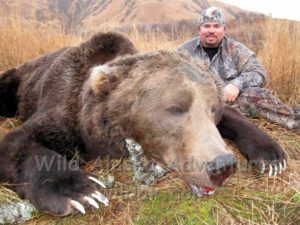 The area we hunt has had little and in some cases no hunting pressure for Brown Bears in many years offering This Client scored a nice Trophy 20 minutes from the Lodge some of the best opportunities available for Trophy Kodiak Brown Bear. In addition, this area also has some excellent hunting for very large Sitka Black Tail Deer. Waterfowl can also be included for a truly awesome combination hunt. 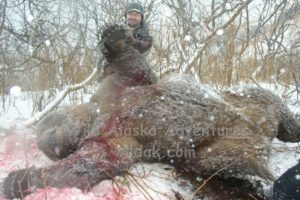 When hunting Kodiak brown bear, experience is a must for a safe successful hunt. Your Guide has been a licensed Guide since 1985. The boat will be used to hunt different valleys if the need may arise. 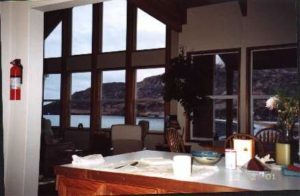 We will be glassing frequently and for extended periods of time. Good quality binoculars is a must. The Deer in this area are not as numerous as some areas of the Island but the potential for a large Trophy is much higher. Waterfowl hunting is literally a stones throw away from the front door with Mallards,Widgen, Golden Eye, Eider A nice Trophy Ducks and more. Sport fishing in the stream below the Lodge is good for Silver Salmon plus some truly amazing Steel head fishing available after a scenic boat ride across Ugak Bay. Black Bass and Halibut can also be found this time of year with the Halibut requiring a little patience. This is a drawing permit hunt in area 03. We can provide all necessary information needed for applying. Our goal is to see that your Kodiak hunt IS the hunt of a lifetime! WE WILL provide the personal service and go the extra mile drawing on all our resources and experience to make this the best hunt you ever went on. First class accommodations in a area known for heavy horns make this the perfect destination. 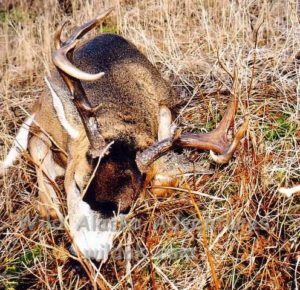 This is a great hunt without the need to hike great distances to get some Deer. If you want a set of horns in the book or just a great hunt in s relaxing environment, this is it. Knowing that there is clean comfortable accommodations after a hard days hunting really makes all the difference on Kodiak Island.